This handcrafted paperweight glows through phosphorous powder mixed into the molten glass. Before its mission swan song, the Cassini probe spotted ghostly curtains of light rippling around Saturn's south pole—the massive planet's aurora. 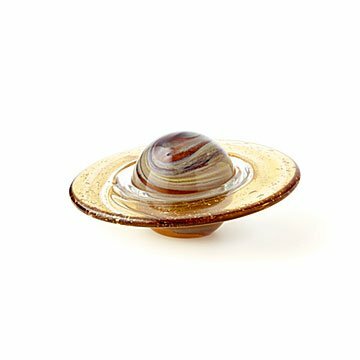 This handcrafted paperweight glows with a little bit of that cosmic energy through phosphorous powder mixed into the molten glass. Chinese artisans fuse layers of translucent glass together at 1,500 degrees and shape them into a glow-in-the-dark sphere representing the ringed planet. The base is ground flat to keep the design steady but angled to add an elegant tilt to the ring. It makes a stellar addition to your home or office desktop and a great gift for any everyday astronomist. Handmade in China. Polish with cotton or microfiber cloth. Ok to use glass cleaner. This shipped very fast and I was pretty anxious to see it! It is absolutely beautiful! It's larger and heavier than I thought it would be, which I liked! The glass and the shape is gorgeous! I'm so happy I purchased this! This was the perfect gift ! This was a gift for my sister and she was absolutely thrilled with it. It's very cool when it glows in the dark but it's also cool when it's in the light. She loves it and so do I.